We’re not clock watchers at Spot N’ Tail Charters, we’ll go that extra mile to make your charter on the Mosquito Lagoon a success! All charter pricing is for two anglers there is a additional fee of $100 for a third angler. Please call about group charters of four anglers or more. We will be stalking and sight fishing the shallow grass flats of Mosquito Lagoon along with targeting the points and bars of the New Smyrna Beach area. We will be using many different techniques to catch fish on the local waters of East Central Florida. From throwing artificial to using the live bait that inhabits the area. Along with targeting fish through out the day, I will also show you different strategies and techniques that I use on a day to day basis to locate and catch fish on our local waters. Our trips are designed to cater to all levels of anglers from beginners to the highly skilled. 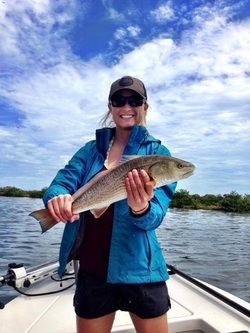 We will be targeting a variety of inshore species like redfish, trout, snook, tarpon and many more that call Mosquito Lagoon, Indian River Lagoon and New Smyrna Beach home. Our goal at Spot N Tail Charters is to supply you with a trip of a life time and memories on the water that you will never forget. Payment made with a credit card will incur a 3% processing fee. We also offer night fishing charters. Spot N’ Tail Charters spares no expense in equipping our guests. Our top of the line 17′ poling skiff will put you right on top of the action while Seeker Rods and Stradic Reels help you fish like a pro. Whether catching tarpon and snook in the backwaters of New Smyrna or sight fishing on Mosquito Lagoon for redfish you can rely on the best equipment on the market. 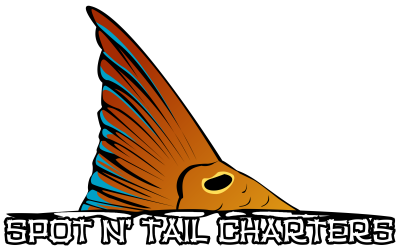 PAYMENT - Cash, all major credit cards or check made to Spot N’ Tail Charters. A $100 deposit is required prior to trip. Payment made with a credit card will incur a 3% processing fee. CANCELLATION - 48 hr. notice of cancellation is required for refund of deposit. A rain check will be issued for trips cancelled due to weather. If rescheduling is not available a full refund of deposit will be applied. WHAT'S INCLUDED & WHAT TO BRING - Bait, tackle, ice and fishing license are included in the charter price. Do to the extreme heat on the waters of New Smyrna and Mosquito Lagoon during the summer months guests should wear cool clothing and bring any drinks and snacks they may like for the day. A pair of polarized sunglasses are also needed along with a hat to shield you from the sun. Both of these items will also help to cut the glare down while in search of redfish,trout and other shallow water species that inhabit Mosquito Lagoon and surrounding waters. We also carry a digital camera on board to capture that trip and catch of a life time. Your card will NOT be processed for a deposit ($100.00) until the charter trip is confirmed by Captain Patrick Rood via e-mail or phone call. 3 or 4 digit security code on the back of the card.